It's my chance to round up the good things to happen this week, celebrate and reflect all the things which have made me cheerful. It's a big list! - Mum has gotten the quilting bug and we went back to Cowslip Farm Workshops for more supplies, inspiration and lunch! It's a beautifully inspiring place, and we need to go back next week (what a shame) so I will take some photo's to share. 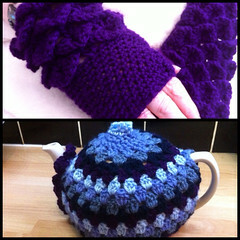 - Completed a couple more projects, crocodile stitch gloves and scarf for Mum and a tea cosy for my friend Kim! What do you think? - I've bought 2-ply hemp to try crocheting more fine and delicate projects which will be very challenging! - My Mum spoke to Amy this week and my heart was lifted when she said she sounds so happy. That's all a mum can ask for, happy kids. - MrC has bought me a new telephoto lens for my camera and a monopod! Looking forward to taking some pictures next week. - I get my operation results and the next steps explained when I see the consultant on Tuesday, six weeks waiting nearly over. - Been signed off from work for another two months. Another eight weeks to get better, relax and improve all my hobbies! PS I spent 30 minutes writing the original post and then very nearly didn't bother at all. It's been a crap week, rows, tiredness, shocked I've been signed off for so long, and the GP appointment has brought Cancer (with a capital C) to the forefront of my thoughts. Got a horrible feeling I will need chemo. However it was draining just writing it and a really crap post! So was deleted. This one is much better and uplifted me. It really works, just listing the good things makes see it was all bad, give it a go!